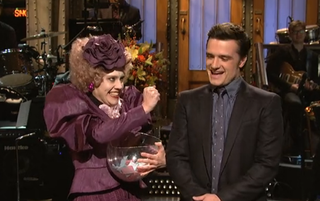 Hunger Games and Catching Fire star Josh Hutcherson hosted last night's Saturday Night Live, which meant a bit of obligatory Panem pageantry, with two cast members fake-battling to the death. It's not a particularly surprising take on The Hunger Games (although there are a few cute moments), but it's Hunger Games fetishism taken to its logical extreme. You put on that Effie Trinket costume, and all you want to do is send people off to near-certain doom. Apologies to folks in non-Hulu regions. If I find a YouTube version, I'll add it.